Mymusicfix has extended the 15% Discount Sale on all inventory items until 8/8! To take advantage of this special offer, please go to www.mymusicfix.com and shop as usual. Upon checkout, enter Audiophile in the promotion code box and your 15% discount will be automatically deducted from your total. Our extensive inventory boasts the best selection of rare Audiophile Vinyl and Gold CDs from MFSL, DCC, CBS Master Sound, MCA, Quadraphonic, Ryko and more! Plus one of the largest selections of Classic Analog,180 & 200 Gram LPs, 45 Speed LPs, Japanese Mini-Sleeve CDs and rare Surf Music CDs! Top 100 Artists Of All Time. Everyone has an opinion about who the real rock royalty are, but see what VHI's poll of musicians and Associated Press concluded were the greatest of all time with mymusicfix's bi-monthly newsletter. "Greatest Hits From The Beginning"
It did not take long for Smokey Robinson to make the jump as one of the premier singers in the Miracle's to one of the premier songwriters in pop music. Bob Dylan has referred to him as "America's greatest living poet," and there are few to disagree with this declaration. Over his 40 year plus career he has written one timeless lovers classic after another including "My Girl," the beautifully constructed and metaphor driven "The Hunter Gets Captured by the Game," and "Let Me Be the Time (on the Clock of Your Heart)," and others such as "Ooh Baby Baby," "Choosey Beggar," and more. Paul McCartney has been compared to the greatest musicians and song writers in history. From his collaborations with John Lennon, to his post Beatle years, McCartney has consistently shown his talents for writing songs that are tuneful and virtually always popular. McCartney is also the most commercially successful of all ex-Beatles and the only former fab-four to form a permanent working band; Wings, which he led from 1971 to 1981. After achieving stardom as the singer, principal song writer, and bassist for the Police, Sting moved onto to a solo career at the very height of their stardom in the mid-eighties. His solo career has been characterized by a restless desire to experiment and take pop music risks. He has sought to push the crafty musicianship and attraction for exotic musical styles, much of what the Police were about, but in ways that a trio could never have considered. Today is he considered among the most articulate rock & rollers and continues to have solid commercial success. In fact, Sting's solo total album sales have now passed the Police's total album sales, a feat few solo acts from major group splits can claim. Frank Zappa has more than 80 albums to his credit as a composer, arranger, guitarist and band leader. Through his 80 album participations, Zappa has demonstrated a mastery of pop idioms ranging from jazz to just about every rock variety possible, to penned electronic and orchestral works; he even testified in Congress against censorship. He has consistently been at the forefront of innovations through instrumentals and studio technology while constantly pushing and inspiring the fantastic musicians around him to be the best of the best, including Lowell George (Little Feat), Adrian Belew and Steve Vai. "Mothers Of Invention at the Filmore East 71"
He was the ultimate sensitive singer/songwriter of the 70's. His well documented inner turmoil's, including his brief stay in a mental hospital, transferred to tales delivered in low-key, folk and jazz style songs that were very prominent early in his career. This open, confessional and emotional style of writing let listeners in unlike few artists have, and subsequently, drew a large, primarily baby-boomer, fan base. The Talking Heads were a band of intelligent and self conscious white musicians that were extremely intrigued by the rhythms and spirit of black music. They drew upon funk, rock and African rock to create some of the most adventurous, original and danceable music to emerge from the new wave. Since their first album that contained "Psycho Killer," which reached the top 100, all of their albums have reached the U.S. top 40 charts making them one of the most accomplished and influential new wave bands of all time. Although Kiss may have been one of the biggest selling acts of the 70's, and all-time for that matter, they will forever be known as the faceless band. For years they were not photographed without their makeup on, accept a few photos of them putting the make up on, but these theatrics and basic hard rock songs became Kiss' backbone. The idea was to make the band a bunch of cartoon-character personas with an evil flair, highlighted by Gene Simmonís bass-playing, fire-breathing, and stage blood-spewing ghoul; needless to say, the idea worked. The Allman Brothers blended strains of Southern blues, R & B, country, jazz, and gospel into a jam oriented style that reflected the emergence of the "New South" that set the stage for Lynyrd Skynyrd, the Marshall Tucker Band, and countless others. Unfortunately, the band was plagued with untimely deaths which led some to the believe that their southern rock pioneering set the stage for the "bad luck" that other southern rockers have met. Wives tales aside, Duane, Gregg and the rest of the band produced some of the greatest records of all-time, including one of the greatest live album performances ever at the Fillmore East. "Japan OBI CD Box Set"
"The Allman Brothers Band (1969)"
& "Brothers and Sisters (1973)"
Originally three Englishmen and one American woman, the Pretenders emerged at the end of the 70's as one of the new waves most commercially successful bands. Chrissie Hynde, the band's focal point, principle songwriter, lead singer and rhythm guitarist formed the band herself over years of bouncing between France and England playing with various groups. After the line up was established, the Pretenders were only two albums deep when the original line up was over; one member died of drug overdose and another was fired and soon after also died of drug overdose. However, the band moved on and proceeded to produced some of their most commercially successful albums and hits throughout the early and mid-eighties. Before his untimely death from a helicopter accident in 1990, guitarist Stevie Ray Vaughan had become the leading figure in the blues-rock revival that he began in the mid-eighties. Vaughan was a blues player by blood following his older brother Jimmy (he helped form the Fabulous Thunderbirds) who was a fine guitar player himself. Together they studied the classic greats, B.B. King, Albert King and Freddie King, while developing their own styles. After dropping out of high school in 1972, Stevie moved to Austin and formed a few different bands before the power-trio Double Trouble was born. They were soon local legends, but it was not until 1982 that David Bowie saw Double Trouble play the Montreux Pop Festival and asked him to play on his single "Let's Dance," that Double Trouble and Stevie Ray Vaughan broke loose. FREE With any order over $100 with Mymusicfix. 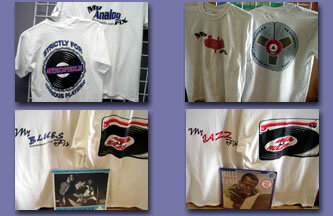 The MyAudiophile Fix T-Shirt is also available in Long Sleeve for $14.99, and in a Sweatshirt for $22.99. Sizes for all T-Shirts, Long Sleeve & Sweatshirts are from Adult Medium through Adult XL. Frame your favorite band or album to display as wall art. 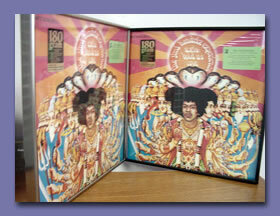 Pick any album that we offer; the album will come ready to place up on your wall.